Mozart's classic opera will be relayed to cinemas around the world, opening the Royal Opera House Live Cinema Season 2017/18. Sabine Devieilhe as Queen of the Night and Siobhan Stagg as Pamina In Die Zauberflöte, The Royal Opera Season 2017/18 © ROH 2017. Photograph by Tristram Kenton. The Royal Opera's classic production of Mozart's fantasy opera The Magic Flute (Die Zauberflöte) will be relayed live to cinemas around the world on 20 September 2017. David McVicar's visual feast of a production will see audiences transported to a fantastical world of dancing animals, flying machines and dazzlingly starry skies. The setting provides a wonderful backdrop for Mozart’s memorable score, which features some of the most hummable tunes in all opera. To enhance your viewing experience, access our Magic Flute Digital Programme for free using the promo code FREEFLUTE, and enjoy a range of specially selected films, articles, pictures and features to bring you closer to the production. The Magic Flute tells the story of Prince Tamino, who promises the Queen of the Night that he will rescue her daughter Pamina from the clutches of the evil enchanter Sarastro. Tamino begins his quest, but all is not as it seems as he and his sidekick Papageno undergo three trials. The opera features some of Mozart's most memorable music, and even the composer's supposed rival Salieri (a conflict so memorably immortalized in the play and film Amadeus) was begrudgingly forced into conceding its genius. 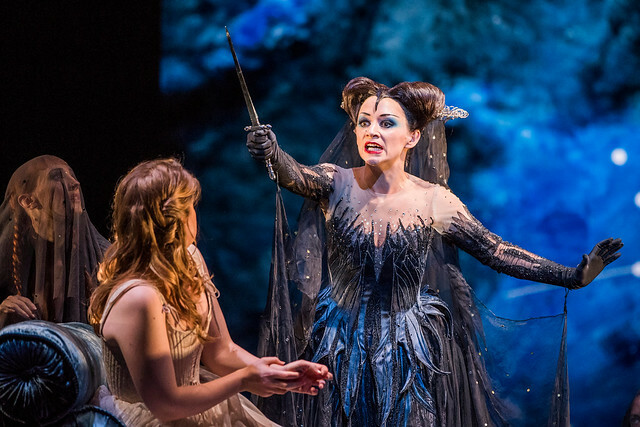 One of its best-known tunes is the Queen of the Night's aria 'Der Hölle Rache' (Hell's Vengeance), a blockbuster battering ram of an aria which sees the character ordering her daughter to kill her rival Sarastro. More than 200 years after it was composed, it remains one of the most challenging pieces for any soprano. Die Zauberflöte, The Royal Opera Season 2017/18 © ROH 2017. Photograph by Tristram Kenton. David McVicar's production had its premiere at Covent Garden in 2003 and features spectacular backdrops, sumptuous period-influenced costumes and puppetry. 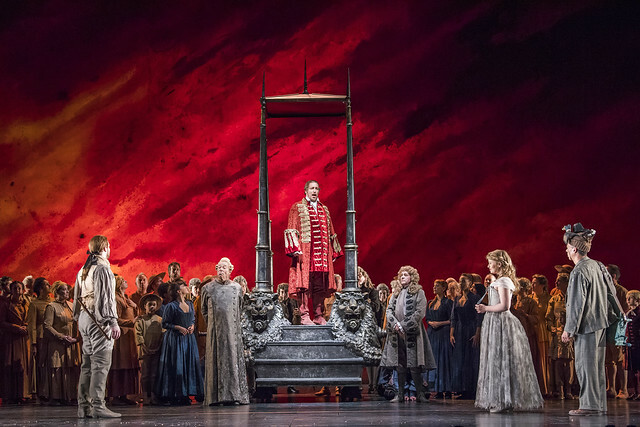 The staging is influenced by the opera's Masonic undertones, as well as the science-first philosophy of the Enlightenment era in which the composer lived. In the years since its premiere it has become a favourite of Royal Opera House audiences and a regular fixture in the repertory. We've rounded-up audience and press reviews from opening night and we'd love to hear from you before, during intervals and after the live cinema relay, so share your thoughts via Twitter and Instagram using #ROHzauberflote. Die Zauberflöte runs until 14 October 2017. Tickets are still available. The production will be relayed live to cinemas around the world on 20 September 2017. Find your nearest cinema and sign up to our mailing list. Have tickets to see Sigor Ross that night - are they any 'encore' performances ?? Can you let me know where to find the print out sheet for the opera so I can use it tonight? All cinemas have copies of the cast sheet available to hand out before the screening. I hope you enjoy The Magic Flute tonight! It's possible that there are no Encore screenings in your area, as the search facility should show all. If you click on "Filter by" you'll find options to select specifically the type of screening you're looking for. We receive regular updates on screenings, so please keep an eye for new ones! Why not a simple link to the page. Not even available at this late stage and I suppose I now have to give up. What a brilliant performance without all that travelling to London. Thank you. Es una producción maravillosa los cantantes muy buenos. Muy emotiva. Felicidades. Estamos disfrutando mucho desde Barcelona. Watched this opera at the local cinema last night. [20th Sep] One of the finest performances I have had the pleasure of watching/listening to. The programme stated that it could be obtained on Blueray but is not listed in the ROH shop. When and where will it be available? Many thanks, hope you enjoyed the cinema performance.